The artist, Hilary Graham will conduct a Walkabout of the exhibition, Remembering the SS Mendi on the 8 June 2017 at 3pm. Hilary Graham was initially inspired to make an artwork about this tragic event when he attended the Xhosa Art and literature festival held at Fort Hare University in 1987. At this festival he encountered S.E.K. Mqhayi’s work and was inspired to create a visual response to Mqhayi’s powerful words. 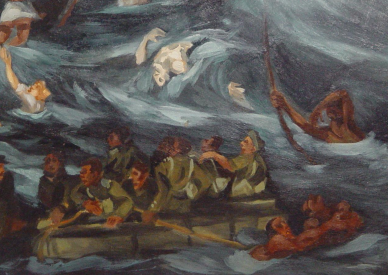 The exhibition Remembering the SS Mendi, reimagines the tragic event in vast series of tableaus depicting the brave men of 5th Battalion the South African Native Labour Corps who died in this nautical disaster. The Mendi installation was produced by Graham over a five year period from 1987 and was intended as a pictorial memorial to the men who died in the SS Mendi tragedy. The exhibition was first exhibited in 1993 at the National Art’s Festival held in Grahamstown. The Art Museum purchased the exhibition for the collection in 1995. A closing function will be held on 8 June at 5pm.